For the third day of the School of Classics field-trip, we left Athens far behind, taking the Metro and two buses out to Thorikos and the Laurion silver mine. 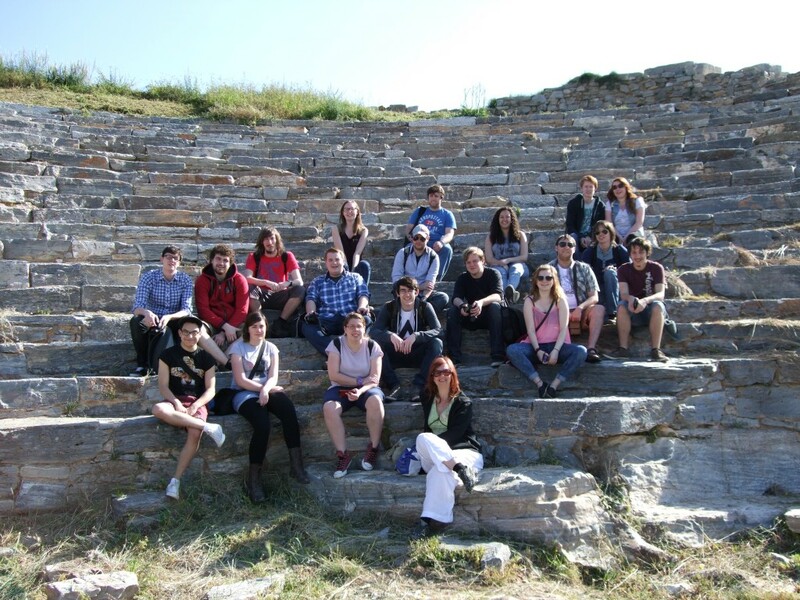 The students explored the remains of the agora and the theatre, comparing them with the much grander ones of central Athens that we saw on Sunday and Monday, before moving across to the mine and the spot where the ore was washed, literally right next to the civic amenities. Luckily for the students, Dr Errietta Bissa studied the Laurion silver mines for her PhD, so was able to tell them everything they wanted/needed to know! From the site, we trekked across country to the Archaeological Museum of Laurion to see the artefacts recovered from the mine and the surrounding area. In addition to lots of interesting inscriptions detailing who was doing what at the mine (and, incidentally, the mines were named after deities – Artemis and Alexander), there were also some votive reliefs, funerary monuments, and lots of pots to see. After finishing up at the museum, it was back on the bus and along the coastal road to Sounion to see the Temple of Poseidon, largely intact, and its Propylaea and Stoa, unfortunately less so. However, for the third years, who will be doing presentations on the heritage aspects of the sites we’ve been visiting after the Easter break, there were lots of interesting graffiti to read.